Find free easy knitting patterns online. Obsessed with knitting? Then you'll soon learn that it can be an investment. When you can find free items for your favorite hobby, that frees up your budget for other supplies -- like yarn. Fortunately, free knitting patterns are widely available. You have your choice of project type, skill level and yarn. There are many sites on the Internet devoted to free patterns for crafters. A great place to start is the websites of the companies that make yarn. These people really know yarn. They know what to do with it, and they pay people good money to come up with fun new things to do with yarn. They are also keyed into fashion trends and respond to requests from knitters who really want to see a pattern for something. Lion Brand is a good place to start. Their patterns are organized by the kind of yarn used. Patterns are further organized into projects for adults, children, infants, pets, home and garden and accessories, so you're sure to find exactly what you want. Coats & Clark offers a great selection of patterns using its yarns, divided into categories for children, adults and home. It's a smaller list than Lion Brand's, but there are still some good projects here. Bernat carries patterns with pictures. The skill level is mentioned on the main page, so you don't have to look through patterns that are too advanced for you. Patons also arranges free patterns according to skill level and suggested yarns. If that's not enough for you, here are a few more places you can find free knitting patterns. The Knitting Pattern Netring offers links to a bunch of different sites that offer free patterns. If you have time to look through all of the sites, it can be very interesting, educational and inspirational. Or look at the titles and descriptions listed on this page to see where you can find what you're looking for. There are more than 200 sites in this ring, so it will keep you busy for a long time. Knitting-and has a lot of great patterns, ranging from afghans and blocks to clothes, color charts, costumes, hats and lace. You can browse patterns by name or photo. 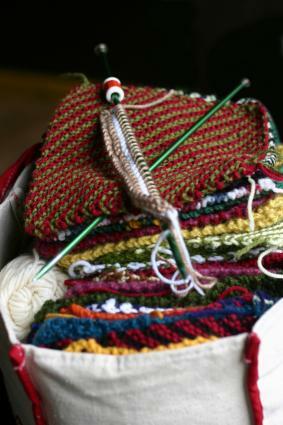 This site also features a blog, information on other crafts and recipes. Knitting on the Net offers patterns for ponchos, sweaters, hats, purses, socks, scarves and afghans, as well as charts for more complicated projects and special sections for babies and kids. This is a clean, easy to navigate site with plenty of pictures within the patterns. Craftown has a good little collection of patterns, many of which have pictures. There are larger collections of patterns here for afghans and baby and toddler clothes, but there are also sweaters, towels, scarves and other projects. Knitting-Crochet has "antique" patterns (some of them are merely old) as well as more modern patterns, organized by who they are for. Some patterns fare better than others in terms of longevity. Still, it's an interesting resource for those who want to see how far knitters and crocheters have come. Every crafter probably has a different system for keeping track of all the patterns she has collected from different sources. What works well for some people is storing patterns in a three-ring binder full of page protectors. Try downloading the file, printing a pattern, and placing each into a page protector in the binder. This makes it easy to find what you need when you're ready to begin a project. Another method is to download the patterns to a file on your computer and only print them out when you are ready to use them. As you collect more patterns, you will find a way to keep track of them that works for you. They key is that you do something, even if it's just stuffing them in a labeled box, so you will be able to find all those great patterns when you need them.